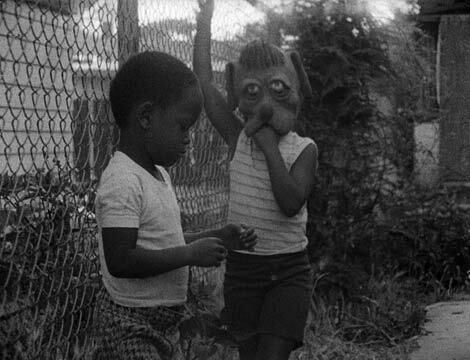 Charles Burnett's Killer of Sheep (1977). A correction: when I cited a few juxtapositions in the film and talked about how the various, disparate images "mingle in the mind," my recollection of the details was a bit off. The boys running in the street (from dogs) is indeed followed by Stan at work in the slaughterhouse, but the check-cashing scene -- which in my head was followed again by a look at Stan's job, and specifically the hooks -- is actually followed by a group of boys riding a bike out into the street in front of a car, which nicely completes a circle of danger, come to think of it. The hooks appear elsewhere.